"A quick and easy family recipe that uses pantry staples. Let the kids choose their own toppings to make this recipe more fun." Turn a 12-cup muffin tin upside down. Nestle 6 corn tortillas in the spaces between the cups to form 'bowls.' Bake in a preheated oven at 375 degrees F (190 degrees C) until warm and beginning to brown, 10 to 15 minutes. Transfer to a wire rack to cool. Cook UNCLE BEN'S(R) READY RICE(R) Spanish Style according to directions on the package. While the rice is still warm, transfer to a large bowl and mix in black beans, corn, tomatoes, and 2 tablespoons cheddar cheese. 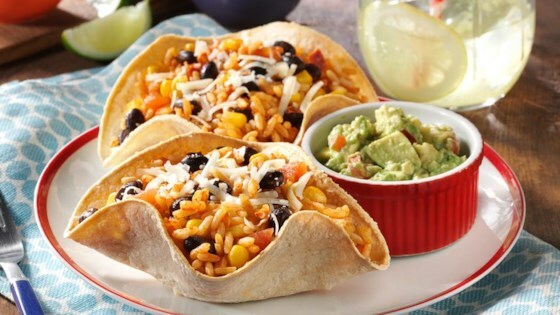 Fill the shells with the rice and bean mixture, then top evenly with remaining cheddar cheese. Add toppings like avocado, cilantro, or olives. Substitute Monterey Jack cheese for the Cheddar cheese, if desired.